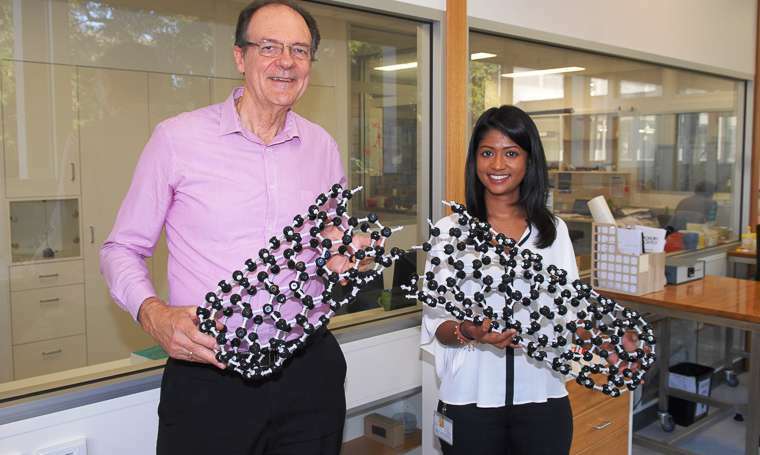 Flinders University Professor Colin Raston and PhD student Kasturi Vimalanathan. Technology used by scientists to unboil an egg is being adapted to precisely cut through carbon nanotubes used in solar panel manufacturing and cancer treatment. Scientists from Flinders University in South Australia have proven their Vortex Fluidic Device's ability to slice through carbon nanotubes with great precision. Device creator and Flinders University Professor Colin Raston said the carbon nanotubes could be commercialised within 12 months. "Importantly for this technology is that we have uniformity in products," he said. "It opens it up for applications in drug delivery if you can get all of the carbon nanotubes to about 100 nanometres … 100 nanometres is the ideal length for getting into tumours so you can actually functionalise them to target cancer cells. "Uniformity in products also means that you can improve the solar cell efficiency in solar cell devices." Carbon nanotubes (CNTs) are minute cylinders of carbon atoms with mechanical, electrical, thermal, optical and chemical properties. They have applications in many industries including, automotive, energy storage and electronics. Flinders University scientists last year were awarded an Ig Nobel Award for creating the Vortex Fluidic Device and using it to unboil an egg. The device can also be used to slice CNTs accurately to an average length of 170 nanometres using only water, a solvent and a laser. It is also a simpler and cheaper process than previous methods, which resulted in random lengths that made it difficult to deliver drugs to patients and transfer electrons for solar panel manufacturing. CNTs are lighter, more flexible and cheaper than solar-cell materials. Flinders University PhD student Kasturi Vimalanathan, who played a key role in discovering new applications for the device, said the machines ability to cut carbon nanotubes to a similar length significantly increased the efficiency of solar cells. "They shorten the carbon nanotubes to fit in all the chemicals so it can withstand high temperatures," she said. "It increases the efficiency and enhances the photoelectric conversion because they can provide a shorter transportation pathway for these electrons. "It's a one step method we can scale up. We can see cheaper solar panels on the back of this development."